I first wrote about Downsview museum shortly before they were evicted for falling 120,000 behind in rent at their historic DeHavilland factory location at Downsview Park. The museum's entire collection had to be packed up and stored (thanks to the generosity of Air Canada) offsite, unseen by the Canadian public. Since then i've waited anxiously for over five years for them to find a new home but as time passes, I can't help but think that the Museum's failure is due to a well meaning but inept volunteer group who lack the resources to move things along, short of some kind of miraculous windfall that will never come. Most recently, I observed they turned to a kickstarter campaign to raise $500,000, clearing $8,000 by the most recent post I can find. So a museum board with no real sources of revenue and apparently no money to spend on a new building waits hopefully for a sugar daddy to come to their rescue. No communication online means no progress except repeated empty promises about being close to major announcements that never seem to materialize. Here's a suggestion for the Downsview team; donate your collection to the Canadian Warplane museum in Hamilton who actually DO seem to know how to run an aerospace museum and pay their bills. 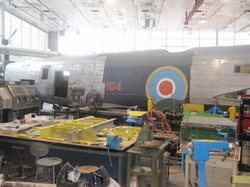 Combining both collections into one large Canadian collection would create a truly world-class aerospace museum and ensure the historic aircraft that have been stashed away unseen for the past six years can once again be viewed by everyone-as they should be. Don't wait once again until you're too far down the hole and your landlord's (Air Canada's) gracious hospitality reaches it's end. At least that is the way it looks to a casual observer. Ok, it's supposed to be for kids but who can resist? Ornithopters namesake, just a little faster but probably less fuel efficient. This one is done in the colours of the Canadian demonstration team although it never flew as part of the team. This nice original Tiger Moth which was actually built in this factory graces the entrance. 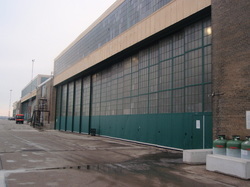 Over 1500 were built within this unassuming building. This project looks like it's going to be quite a few years before the museum staff will have to worry about a display area for it. 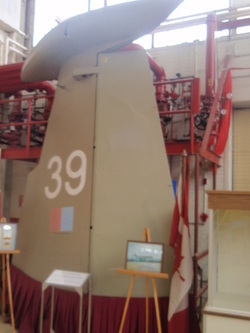 this bomber used to grace the Toronto waterfront but thankfully, it was removed and brought indoors. Lots of Lanc components litter the warehouse. i'm not sure what they'll do with it when it's finished because there certainly isn't enough room in the existing hangar for an assembled bomber. 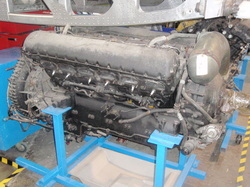 One of the four original engines. A photo of a photo of the old DeHavilland assembly line and the current space in the museum today below with an Orenda engine in the foreground (in the second photo of course)..
A T-33 jet trainer, Canada's first jet trainer of which two squadrons were based here. This Beaver is privately owned and flies regularly in the summer but it makes an appropriate addition to to the museum during the off months. 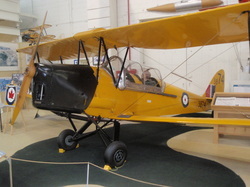 Reproduction of the Silver Dart, Canada's first airplane hangs from the rafters. 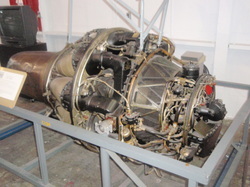 Another Canadian aviation benchmark-jet engine from the Avro Jetliner. One of Canada's contributions to the space shuttle program was of course the CanadArm, a 2/3 version which sits in an upper alcove of the museum. Close the door-there's a draft. I always thought that the old style hangars were underappreciated as very nice architectural design-this would have been the main access door to the runway from the De Havilland plant back in the day. More hangar space now converted into squash courts. I spotted this lone Tracker with wings folded across the field-yes, I have a cheap camera. Apparently the museum does not have quite enough space to keep it indoors. 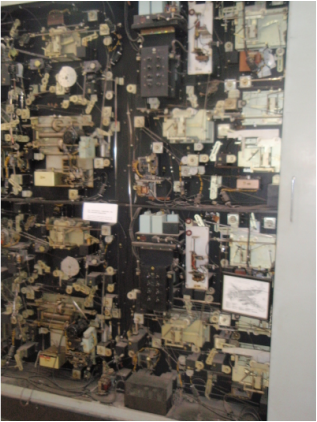 I found this tucked away in a back corner of the museum-it is actually part of the flight simulator computer for a Vickers Viscount and stands about 6 feet tall-in it's time I imagine it would have been a state of the art computer. Dear Prime Minister Harper,I am writing this letter to express my concern over the imminent destruction of arguably one of Canada's most historic landmarks, the Air and Space museum at Downsview which is slated to be torn down and replaced with a hockey rink. 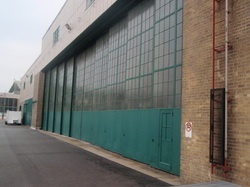 This building was the original home of the DeHavilland Aircraft company and over 1500 Tiger Moth aircraft were built within it's walls-arguably one of the most famous Canadian aircraft designs. 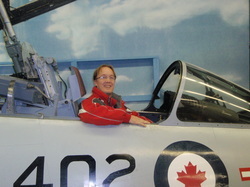 It was also the home of Canada's first jet fighter squadron, not to mention countless other historic aircraft. 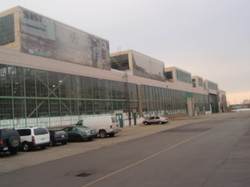 If there was ever a suitable home for the only Avro Arrow replica, it is within the walls of this building. 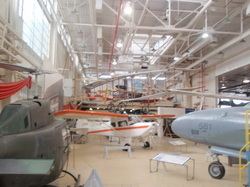 Please visit this museum to understand it's legacy to Canadian aviation and assist making it a designated historic site so that it is not destroyed by short-sighted land developers. I'm sure the building could be incorporated into any existing development without it's destruction.